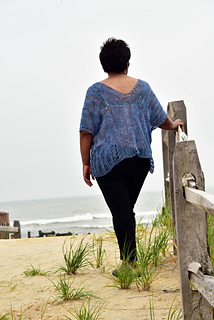 Get the Boardwalk Top as part of the Jersey Shore Knits II ebook. The Boardwalk Top is made for the shore. 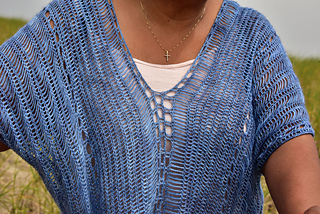 Knit in a lightweight yarn, the openwork lattice stitch is airy enough to wear all summer over a tank top or as a beach coverup. The stitch motif is inspired by the way the slats of the boardwalk create a geometric pattern of unexpected beauty. Knit in a simple rectangle, after blocking and seaming, the lightweight fabric will curve to fit the shape of your body when worn. 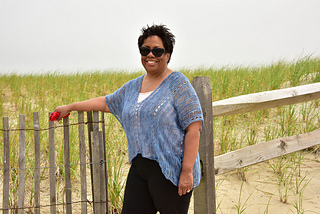 A shawl in the same stitch pattern can be found here. Best worn with 20-28” (60 - 70 cm) of ease. Model is shown wearing size medium. Needles: Size 6 (4 mm) needles, or size needed to obtain gauge. Gauge: 16 sts x 8 rows = 4 x 4” (10 x 10 cm) square in lattice stitch after blocking. Other Materials: Steamer, blocking surface, pins, blocking rods. Woolbearers, located in scenic Mount Holly, NJ, is a full service yarn and fiber shop with its own line of hand dyed yarns. This lightweight merino bamboo blend is one of many beautiful yarns dyed and sold exclusively by Woolbearers. Visit www.woolbearers.com to shop, find classes, or to plan a trip to this one of a kind store. Model Pamela Womble and her husband, Chef Herb Allwood, own 701 Mosaic Bistro in Ocean City, NJ. Their menu offers an exciting array of old and new world flavors and showcase their passion for Caribbean and Mediterranean cuisine. Visit www.701mosaic.com to see the menu and to learn more about this local business.